King King was a former Chinese restaurant on the north west corner of 6th and La Brea in Hancock Park. 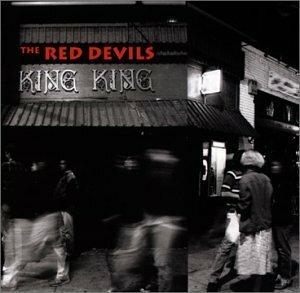 In the early 90s, Monday night regulars The Red Devils staked their claim to be Los Angeles’ biggest bar band, drawing in city bluesheads and celebrity scenesters alike with their raw, straight-ahead juke joint sound. Originally known as The Blue Shadows, the band coalesced into a settled line-up around Virginia-born wild man and harmonica player Lester Butler. On the traps, The Blasters‘ Bill Bateman, one of the greatest ‘feel’ drummers in roots music, teamed up with bassman Johnny Ray Bartel of The Knitters to provide that essential undertow to the Devils’ shuffle – Bateman a touch late, Bartel a tad early on that crucial beat. Dave Lee Bartel’s brick wall rhythm guitar anchored the lead lines of a prodigy: Paul ‘The Kid’ Size interlaced unobtrusive, sympathetic guitar licks with Butler’s harp and voice and, when let off the leash, he really flew. Their debut album, naturally named King King, was produced by one of those celebrity club visitors: Rick Rubin of Def American Records, the man responsible for the release of some of the most crucial rock and rap albums of the 80s. Truth be told, there’s no sophistication in the production of King King – all Rubin does (it’s a great achievement and we thank him for it) is perfectly encapsulate the raging sound of a live blues band on top form. Listen to the disc (recorded over three regular Monday night slots at the club) and you’re there – you can feel the sweat, you can hear glasses clink, the waitress nudges you in the back as your order arrives at your table (don’t forget to tip now), Butler announces the songs, counts off and you’re pinned back in your imaginary seat as this… elementary force blows out from the stage. There is a sixth musician up there, eminent West Coast pianist Gene ‘Fingers’ Taylor, but to my ears, he could have stayed at home, because the evil, fierce blasting of the Devils renders the keys all but inaudible. Butler, howling simultaneously into harp and vocal mike and blowing up the proverbial storm, leads the band through nine blues standards and just three originals – fear not, dear readers, because one of those Butler songs is a stone classic and alone is worth the price of admission. Willie Love’s Automatic, the opening track, has become The Red Devils signature song and the band whip on through Goin To The Church and a blistering She’s Dangerous taken at a slovenly tempo (one of three Willie Dixon numbers on the record). As good a start as that is, they go on to reach even greater heights. A cool version of Billy Boy Arnold’s I Wish You Would leads to a genuine highlight – Cross Your Heart, one of my all time favourite Sonny Boy songs and done great justice here by Butler. A stuttering Willie Dixon riff and Butler lyrics materialise as Tail Dragger, and the swaggering dance of Devil Woman leads to the classic song – No Fightin’, as good an exercise in blues dynamics and creative tension that you’ll ever hear. The guitars have been excellent up to now: notwithstanding the ferocity, they fit perfectly around Butler – because this is a harp album first and foremost – but during Mr Highway Man, you pin back your ears and listen to the swing of the ensemble playing, but.. wait.. Paul ‘The Kid’ Size! There he is! In truth, he’s been there all along, but the intricacy of the lines he weaves through this song, that’s what hits you right now. And all of a sudden, you want to go back to the start of the CD and listen to Paul, and only Paul. But you can’t. Because there’s a Slim Harpo-ized version of I’m Ready next up. Then a brooding take on Little Walter’s Quarter To Three. Then a blaze through Junior Wells’ Cut That Out, with a grandstanding Lester Butler extended ending you’ll all want to emulate the next time you’re on stage, and a rare solo from The Kid that strips paint off the walls. And that’s it, just short of sixty minutes: on record The Red Devils leave the stage for a break, and in your living room, you’re shattered. Time to put the kettle on (or go find a cold one in the kitchen). Unfortunately, astonishingly, that’s pretty much the entire recorded output of the band (there’s an EP called Blackwater Roll, if you can find a copy). Being as how this is about the album, I’ll leave you to Google to get the continuing story of Lester Butler and the band – let’s just close with a couple of comments. This album does not feature a technical exercise in harmonica playing. Frontiers are not pushed back, boundaries are not stretched, rules are not broken. It ain’t.. jazz. But the jolt of electricity, the vitality that you feel when you listen to King King.. that’s what the best blues music is all about, for me. It’s almost primeval. It’s an inexorable force. You feel it deep down in your.. yes, goddamit, I’m going to say it… your soul. And that’s what keeps me coming back time and again to this record, nigh-on 20 years since its release. For more musical musings, wit and incisive observations from the Captain, visit his wheelhouse at The Riverboat Captain. Thank you Captain, for the review of my all time fave live album. And you picked THE classic ‘No Fightin’ which has always been my top tune on it. Lester the Legend lives on. He worked like a Trojan when I saw the Devils in London (Thanks for the reminder that it was 20 years ago!). I’m glad you enjoyed it. I’d long wanted to write a review of it but it didn’t seem to quite fit on my own blog. When I got the opportunity at Harp Surgery, I was very happy to do it. One of the best blues records ever, in my opinion. THE most exciting live harpblues album ever. I’m assuming you’ve checked out an album called ’13’? It’s by ’13’ features more Lester – Awesome! Yup, ’13’ , IMO not perhaps quite as thrilling as ‘King King’ but still a great juke joint album. Classic album! Should also check out The Red Devils ‘live At the Borderline London’ Boot that is also a must have. Straight from the soundboard, not as dynamic and in your face great as King King but for Devils fans…you need this. Search the web you can find it!! !